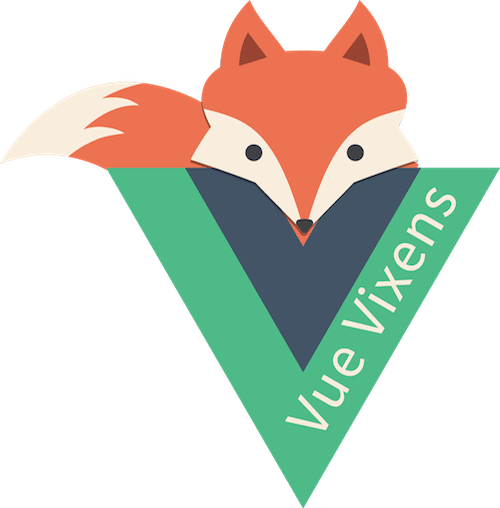 It’s my great honor and pleasure to formally introduce to the world a program, project, and community, Vue Vixens! 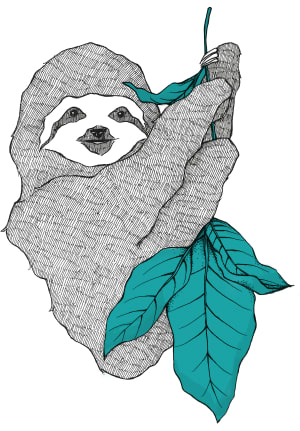 We are also very happy to launch this new blog, kindly hosted by our friends at Dev.to! 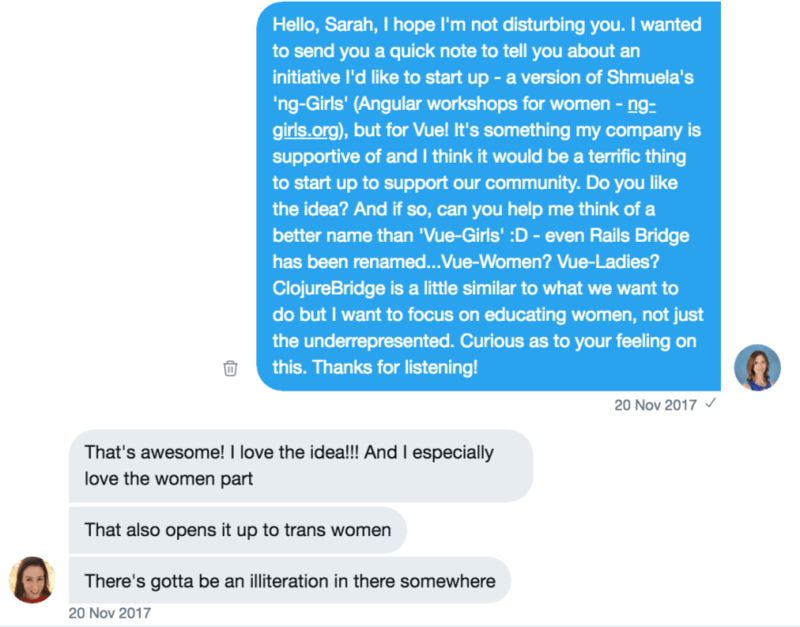 I didn’t want to call it ‘Vue Girls’ or some such name, as I want to be more transgender friendly and I’ve never liked being called a ‘girl’— so following on Sarah’s hint of alliteration, I struck on the name of Vue Vixens — sassy and fierce, with a foxy flavor. I created a logo and launched the program on the big stage at Vue.js Amsterdam. To my astonishment, the program — which hadn’t even hosted a mini-workshop yet — was met with great enthusiasm in Europe, garnering many tweets, DMs, and pleas over email to start programs there. 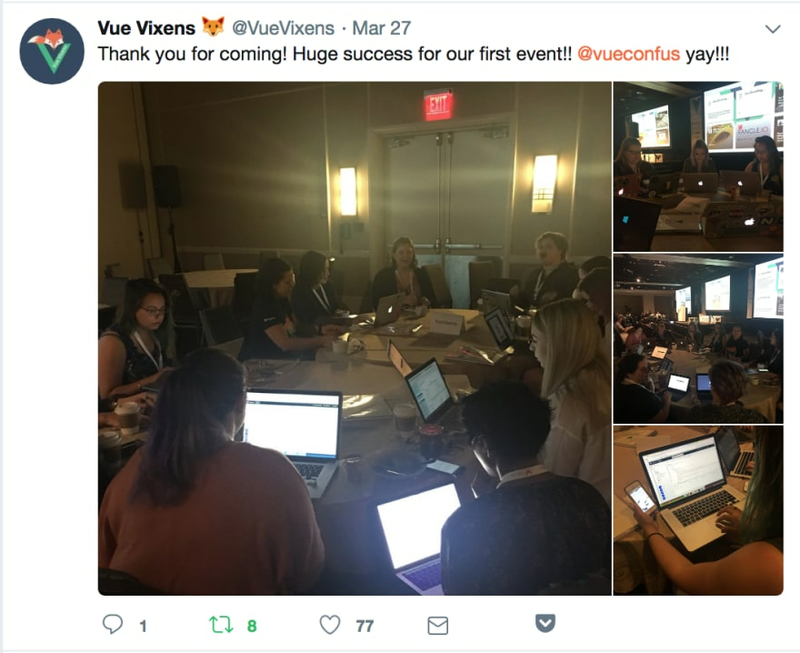 Our first formal activity took place at the Vue.js USA conference in late March 2018 where I handled the conference’s diversity scholarship as one of the conference’s community partners, gathering entrants for a free ticket to the conference and picking 5 winners out of 54 entries. We also had our first mini-workshop before the keynote on the first day of the conference, filling two tables of enthusiastic women programmers and working together to build a mobile app using the NativeScript Playground. In 20 minutes, every attendee built a ‘pet-finding’ mobile app and had it deployed on their phone. We were having by far the most fun in that room in the morning, making a lot of noise and socializing — to my surprise, many workshop attendees remained at that table throughout the day, forming a little community spontaneously on their own. Consultation and management for conference diversity initiatives, including the creation of a scholarship fund to help attendees offset their conference travel and hotel costs. All of this work has generated a community, whom you can find on our Slack channel. And we are everywhere! 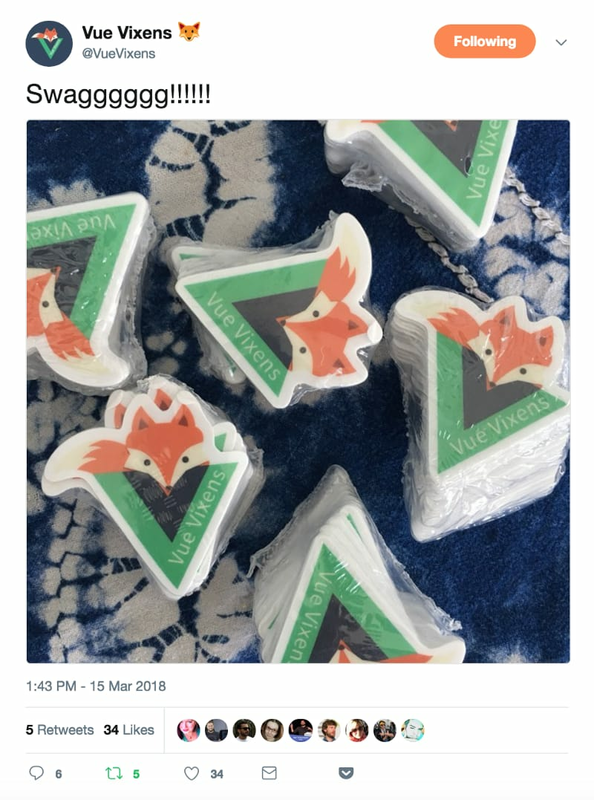 A group in Argentina, led by our Regional Director the Awesome “SuperDiana” in Buenos Aires, has launched their own Vue Vixens meetup and has already generated solid interest and support within the Argentina Vue community. Our MVP, CTO and fantastic partner, Natalia Tepluhina in Ukraine, has worked tirelessly to create workshop content, to enhance the website, and to extend the program. We are proud to have partnered with Particle.io, makers of the Photon, who have generously provided us with IoT kits that we already used in Paris and will use again in New York. 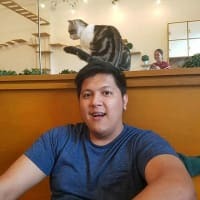 We have gotten support from software companies offering us free services such as Typeform and Storyblok (a real godsend to a community on a budget!) Growing rapidly, we are also working to become a Private Foundation, affiliated with Progress Software, and have formed a board of directors to oversee our activities. Prominent amongst the members is the founder of Vue.js, Evan You, as well as CEO of Progress, Yogesh Gupta and other luminaries. Learn more about our team http://www.vuevixens.org/team. Yogesh and Loren, CEO and CMO of Progress, work on a mini workshop using the NativeScript Playground to build a mobile app, at the ProgressNEXT conference lunch'n'learn skulk. 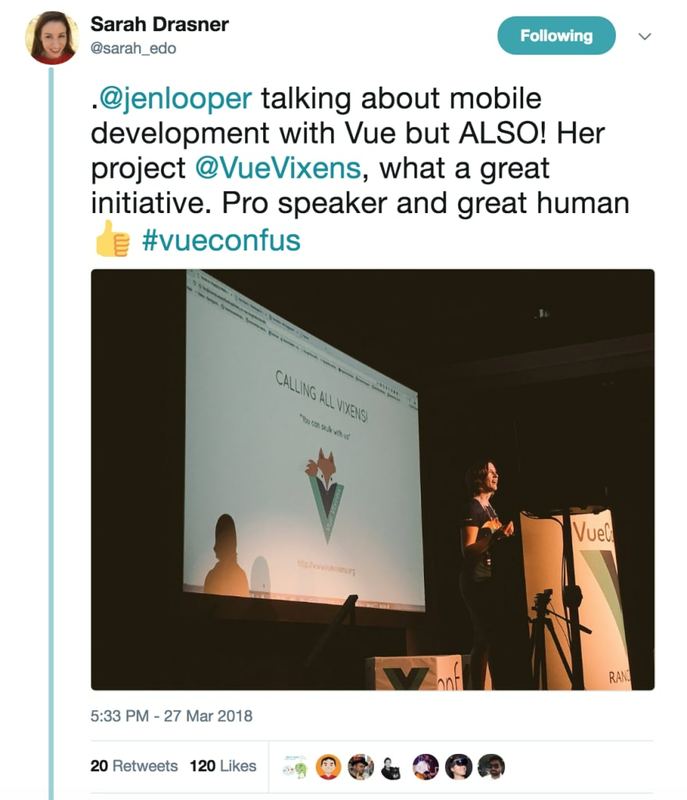 Vue Vixens Workshops are ALWAYS free and ONLY for women or those who identify as such. Anyone can be a mentor!. We prefer a person affiliated with Vue Vixens, however, to be the leader of a Vue Vixens Skulk. Women are our target for workshops but we usually recruit from the conference speakers to help out and it's a great experience. For the Vue Vixens skulk Sign ups, we prefer for you to use our sign up form - that way we can help properly filter sign ups to ensure the real purpose of a diversity offering. If your employer would like to support us, please get in touch via email at http://www.vuevixens.org and our Github repos. Workshops: You can find our workshop content here. Minis: Mini workshops are listed as short tutorials such as this one. DIY: There’s a template online for a mini, if you’d like to write one. Contact: Email us at Vue Vixens. Hope to see you soon, at an event near you! So awesome to have you and this great project, Jen! I'm of the mind set that women don't need special help in the tech-industry. I believe women are capable of what men are without groups like these. Gender equality in the tech-industry has a long way to go to be "equal". I don't think groups like these help create gender equality but rather create a literal divide between genders. I am willing to hear what your thoughts on this is. I don't understand how #diversity and exclusionary groups like this have anything in common. I think if you would read the article and peruse our web site, you would understand that we are not "exclusionary". I've also opened a library on the site for people to learn a bit more about what women face in this industry; we are a group that is trying to help. I also note that you are on the faculty of Boston University in the CS Department. Perhaps you can tell me how you are supporting diversity efforts from within your department? I'm a Wellesley/U. C. Berkeley alumna and probably your neighbor. If you are a new Vue.js developer who uses the pronouns "she" or "they", you are welcome. We hate to leave anyone out, but this group is for women, and those who identify as such. Pretty sure that is the definition of "exclusionary". Boston University has a very strong effort around diversity and inclusion, and the CS department actively engages in both the college's work and its own initiatives. The department sponsors several woman-specific clubs and programs, and our enrollments are close to 50/50 (female enrollment in introductory CS courses last year was at 47%, up from about 15% ten years ago). As a faculty member I support this work; I was recently a judge at a girls-only hackathon on campus that drew about 800 female participants, for example. My personal opinion is that many individuals and organizations try to force diversity with set-asides, quotas, and exclusionary practices that while, on the surface, seem to balance out a population, in fact have the effect of promoting bias and discrimination within and toward groups of students such as women. I also feel that such special treatment can result in an individual seeing themselves as apart and not equal to others in a given field of endeavor. For example, the message that I got after two days of working with the all-girl hackathon participants and organizers was that girls aren't capable of competing with boys, and so a special environment was created to "protect" the girls. We've created a society in which race, gender, and to some extent religion are sharply highlighted. When does a day go by that we don't see a headline along the lines of "Black Woman Named Head of Such-and-Such" or "First Jew Elected to Governor's Office"? We constantly label each other in this way, and I think that every time we do the divide between us deepens. Discrimination runs very deep in the American culture, and we are just making it worse with our attempts to "fix" things. Artificial fairness isn't really fair, and fighting discrimination with yet more discrimination isn't logical. If a person is interested in computer science (or any other field), they should be supported and encouraged with no qualification. I'm part of something amazing that is certainly NOT a pink corral. So I cannot tolerate such levels of ignorance from a white man, who talks about diversity and ... who screams "exclusionary" just because they think they are ENTITLED to every benefit. Especially when what we do is an awesome way to empower minorities and help them become part of an entire ecosystem. We are working hard and collaborating shoulder to shoulder with great people, regardless of gender to teach and encourage under represented minorities. If resources and opportunities were really equal for everyone we wouldn't need to solely focus on a single target, but oh do we include everyone in our efforts to bring these women and those who identify as such together and help them with what we can do best in our areas of expertise. So yes, it irks me that someone who is supposedly a lecturer and daring to talk diversity come up with such a narrow minded comment, like are you going to criticise admirable work of inclusion from the comfort of your sofa or are you at least going to make the effort of being informed. It frustrates me but some men are so hard headed and in need of having their last word, or just have their ego filled with being part of everything! Even those who believe that sitting with women makes them super deconstructed. For me there was never a difference... But some people make it so much harder... So, yes... I do not tolerate mansplaining. Apart from all this, we all have the right to have our own spaces, and what's wrong about it? Do you have to be everywhere? Perry, it sounds as if your department is doing very much the same thing that you decry: "The department sponsors several woman-specific clubs and programs". Sounds like you're not on board with your department's values, which is not my business. It also, however, sounds as if you disagree with the value of programs such as those your own department sponsors as well as ours, which is my business. So let me just respond, and then I'm going to get out of this pigpen, because I have a lot more important things to do, like organizing about 10 events in the next couple of months and traveling to do some incredible things with my sister Vixen in Argentina, who responded above. I'm not very interested in having my own program mansplained back to me, so let me just mention that if you look more closely, we are interested in education for women and people who identify as such, and we are happy to have the help of mentors from all walks of life who are TRULY interested in doing something about the abysmal percentages of women in the industry. Perhaps you might become such a mentor? This is not about special treatment. This is about welcoming new voices who very often don't feel heard or welcomed. You quote great numbers from BU for introductory classes. That's fabulous. But what about your higher level CS classes? What are you doing to ensure that attrition doesn't happen because of underlying attitudes such as those we meet EVERY DAY in this industry? How many women graduate from such a program? And do you have any idea how many women drop out mid-career because they've simply had enough? We do. 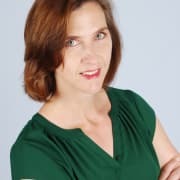 We are here in the trenches (not in the academy) mentoring women who are trying to start out (fixing the pipeline) and making sure to mentor mid-career women who face significant challenges in their careers as they attempt to progress. We are in the business of making changes, not throwing obstacles in peoples' paths. Can you say that you do the same? Thank you, that's all that I'm going to say. Perhaps I'll see you in a Boston meetup where we can meet face to face. Or perhaps you'd like to attend a conference talk, I give many worldwide on bleeding edge tech, as do many of our Vixens. Whether or not Perry is making a valid point, you are twisting his words to make him seem against the promotion of women in tech. I think his point is that there are better ways of increasing fairness and equality then creating systems that are exclusionary by gender. Instead of creating systems that exclude by gender like your own, create systems that allow both women and men. For example, create support groups for people entering the tech-industry especially vue with a specific aim at supporting all groups of people. This means that if a white straight male feels left out, you accept them, if a black gay women feels left out you support them.